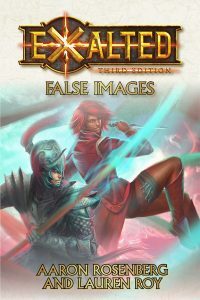 Now available in ebook and print from DriveThruFiction: False Images, a new novel for Exalted 3rd Edition! Novia Claro made him up to cover her own tracks while she investigates the murders of Hushanti’s priests in Nexus. He’s a convenient ruse, a rumor to spark the people’s imaginations, distract them from her actions, and nothing more… until the day he bursts forth from the river and offers Novia his help. Now he’s hunted by several Dragon-Blooded, and Novia has to figure out whether she can trust him or if she’ll end up as just another body left in his wake. Keep an eye on this space for links to Amazon Kindle and B&N Nook ebook versions! 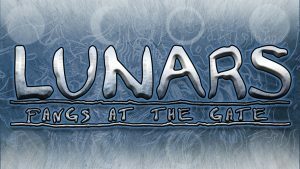 Our Kickstarter for a deluxe version of the upcoming Lunars: Fangs at the Gate for Exalted 3rd Edition ends in ONE DAY! Exalted fans managed to hit our goal in a mere 39 minutes! Next entry Episode 43: Let Us Sell You On Some Games!